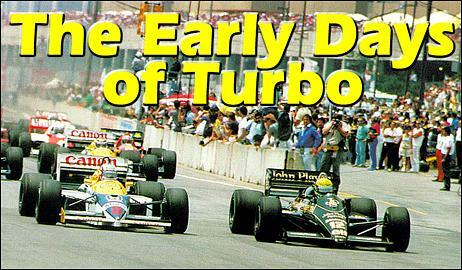 While turbochargers had been used in an assortment of racecars prior to the 1970s, it was the 1977 - 1988 Formula One turbo era that brought an intense burst of development. With the involvement of major car companies - most notably Honda, Renault and BMW - the sudden increase in R&D that went into turbocharging was monumental. Today - twenty years on - we've seen turbochargers accepted into mainstream mass-produced performance vehicles and those golden years of F1 turbocharging are remembered as something of an 'automotive fairytale'. 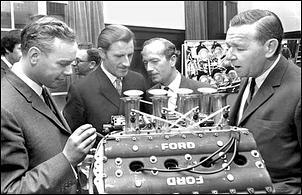 From the late 1960s through much of the 1970s, almost every Formula One team used Ford's venerable Cosworth DFV V8 engine - it was the engine to have. These 3.0-litre V8 race engines breathed through 4-valve heads and employed mechanical fuel injection, slide-type throttles and - thanks to the fitment of CDI - could rev up to 13,000 rpm. 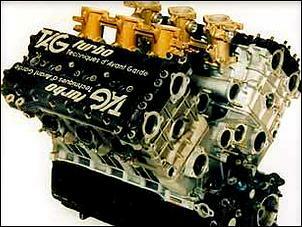 Ferrari also campaigned a highly complex flat-12 engine at the time, with both engines reputedly making in the vicinity of 525 horsepower. Coinciding with this era, aerodynamic 'ground effects' had enabled extraordinary amounts of downforce with a minimal drag trade-off. 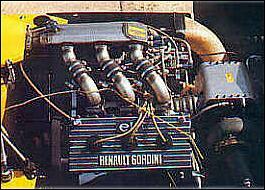 In 1977, Renault was the first team along pit lane to experiment with a new breed of smaller capacity turbocharged engines. This gallant move was motivated by the company's foreseen image boost, technical spin-off and employee inspiration. Following the guidelines set by the governing body, Renault designed a turbo engine that could rival the all-dominating Cosworth 3.0-litre V8. Note that the maximum allowable swept capacity of a force-inducted engine had to be half that of a naturally aspirated engine - hence Renault's turbo engine, and all that followed, displaced a maximum of 1.5-litres. 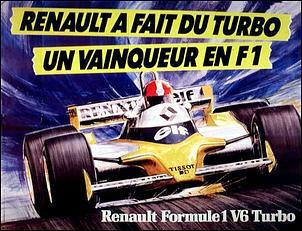 In 1979 - just two years after their brave debut - Renault had won its first Grand Prix with a turbocharged engine. And that's when the rest of the field started to take notice - in fact, the majority of teams had proceeded to jump onto the turbo bandwagon by 1983. There were many engine configurations employed in a number of different chassis. To name just a few, Renault stuck with its DOHC, 24-valve 90-degree V6 (which went on to receive twin-turbos and a water-to-air intercooler at one stage), the twin-turbo Porsche/TAG engine used a 80-degree V6 platform and both Cosworth-Ford and Ferrari adopted a twin-turbo V6 block set at 120-degrees. Curiously, BMW adopted a single turbo, DOHC 16-valve, in-line four-cylinder (which was based on an already-aging engine design), while Zakspeed also competed with a single turbo in-line four-cylinder. Alfa Romeo even made a showing with a 90-degree V8 engine hung with twin-turbos. These first turbo engines were quite crude in many ways; they used a diesel engine based turbocharger, their static compression ratio was extremely low (around 6.5:1) and there were problems delivering the necessary fuel injection and ignition timing. 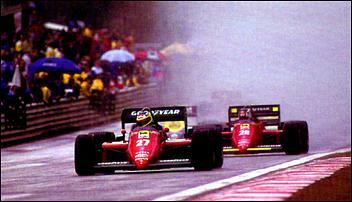 This meant that bulk-rich mixtures and conservative timing had to be adopted to ensure a vehicle could finish a race. A technological step backward was also taken in regard to intake throttles - the turbo engines reverted to conventional butterfly throttles due to concerns that the movement of slide throttles might be affected by boost pressure. Note that the early 1.5-litre turbo engines also had a lower redline than the 3.0-litre naturally aspired engines - between 10,500 and 12,000 rpm was the redline for the entire field of turbo engines. This later increased to around 13,000 rpm. Boost pressure was quite low during these early years. Engines were boosted up to a relatively modest 2.5 Bar (absolute pressure) and there was great focus given to intercooling; it is said that charge-air temps were dragged down from 240 to 40 degrees Celsius post-intercooler. Such a configuration was good for around 650hp at the flywheel - BMW, for example, claimed 640hp for their 1983 Driver's Championship winning engine. 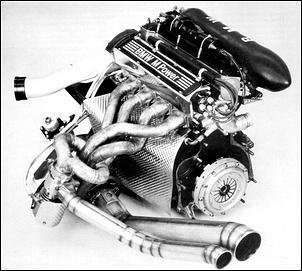 Obviously, the turbo engines were now making a lot more power than the naturally aspired 3.0-litre F1 engines, but there were many concerns other than from outright power. Turbo lag, low-rpm torque and drivability were truly appalling and, as a result, the turbo cars were consistently slower around tight racetracks. As fuel injection and turbo technology progressed at an incredible rate during the early '80s, teams were able to - relatively safely - push boost higher and higher. Of course, there were a few engine and turbocharger failures along the way, which often led to spectacular fires ... Increases to 3.5 Bar boost became common for each team, giving rise to well over 700hp at the flywheel - nearly a third more power than the competing atmo DFV V8. 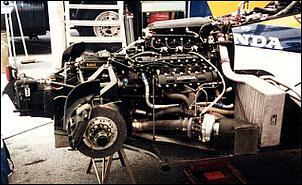 Perhaps more importantly, the new developments made the engine more progressive and, therefore, easier to drive. Lag and low-rpm torque had been massively improved (partly thanks to the introduction of ball-bearing ceramic turbochargers) and Ferrari, albeit briefly, had also developed what we now label an anti-lag system, whereby a fuel/air mix was ignited in the exhaust manifolds. Ground effect aerodynamics - which had absolutely transformed the sport during the '70s - was officially banned in 1983, resulting in a halving of downforce. This meant teams had to go back to fitting massive wings, which - although restoring some of the lost downforce - came with a major drag penalty. This happened to play nicely into the hands of the turbo cars, which could generate the immense power necessary to haul the high drag wings through the air. A drag co-efficient of 1.5 (more than three times worse than the average family sedan) had become common 'overnight'. Late 1983 also saw the first teams using so-called 'jungle juice'. This heady mix of chemicals - which was just allowed under the governing body's loose terminology of 'fuel' - gave tremendous resistance to detonation and allowed boost pressure to soar. The BMW-Brabham, for example, was boosted to 4.5 Bar (absolute pressure, remember) for qualifying and output swelled to over 1000hp. 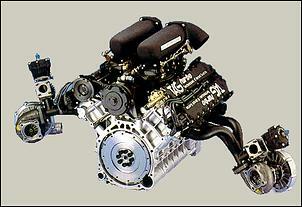 For races, however, boost was reduced to give 'only' around 750hp - reliability was the name of the game. Drivability was also further improved, since the new jungle juice allowed a much higher static compression ratio (anywhere up to 9.4:1). 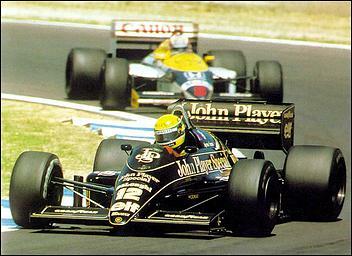 The Formula One turbo era was as much about manufacturer marketing as wining championships. With the public witnessing the advantages of turbo technology - in a wonderfully spectacular fashion - the consumer market received a sudden influx of production turbo cars. During the early '80s, vehicles such as Honda's City Turbo, Renault's Uno Turbo, BMW's 7-series turbo and, of course, Porsche's legendary turbos enjoyed terrific sales success - and paved the path for every turbocar to date. Of course there were a number of trade-offs that had to be made. The increased charge-air temperatures associated with such boost called for elaborate intercooler water spray systems, which poured out around 3-litres per lap. More horrendous, however, was the rate of fuel consumption - teams now had to be very careful not to run out of fuel during the race. Furthermore, the massive top-end power also created a very steep power curve that many driver's struggled to manage - for example, the single turbo BMW engine's power tripled between 6000 and 9000 rpm. This made driving a challenge - especially when considering the cars were limited to the same wheel and tyre size that had been used since 525hp atmo engines were the norm! Note, however, those cars using smaller twin-turbos were reputedly more responsive and progressive than the single turbo competitors. From here, the horizon drew near for the turbocharged beasts. 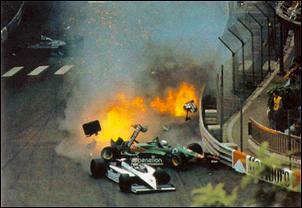 With increasing focus on safety and cost, measures were taken to slow the turbo cars. First, a race-day fuel ration was introduced in 1986 spelling a reduction in boost pressure and the end of any form of anti-lag systems. Simultaneous improvements in engine management allowed teams to safely run their engines a bit leaner (to help save fuel), but there was still a considerable overall power loss. Following this, in 1987, a 4.0 Bar boost limit was introduced whereby a pressure relief vale (aka pop-off valve) was fitted to the intake manifold of each car. Fighting a 4.0 Bar ceiling and tough fuel rations, many teams now reverted back to naturally aspirated engines. The last straw came in 1988, when boost was regulated to just 2.5 Bar and a harsher-still race fuel ration was introduced. This saw even more of the field step backward to naturally aspirated engines in preparation for the announced 1989 turbocharger ban. Still, with the awesome combination of Ayrton Senna and Alain Prost at the wheel, the 1988 McLaren-Honda turbo showed its worth by winning an amazing 15 out of 16 races. To this day, the McLaren-Honda MP4/4 remains the most successful F1 car, having won the Driver's Championship in '85, '86 and '88.